Key facts: This certified-organic family farm is run by siblings with a dedication to indigenous grapes of their inland Campania home. Natural yeast fermentation with no wood. Aged nine months in tank and three months in bottle. Grapes and wine moved entirely by gravity under a blanket of inert gas and crushed in a closed press to minimize SO2 use. 15-25 day fermentation using natural yeast in stainless steel. Grapes and wine moved by gravity, kept under a blanket of inert gas and crushed in a closed press to minimize oxidation and lower SO2 usage. At first I felt like my GPS was deliberately keeping me on the small roads, like when you accidentally set the infernal thing to avoid tolls and are perpetually winding through tiny unidirectional cobbled village streets, while tractors bounce ahead at 20km/hour, pulling trailers full of roasting Falanghina grapes, and pensioners amble in front of your vehicle to visit tobacconists and fruit stands. I’ve never seen as many tractors in my life as I did today. It’s not the GPS. Benevento isn’t a province of wide well-paved main roads. There are small passes, dark tunnels, and lots of winding up through hillside towns past giant prickly pears and ripe persimmons to reach Guardia Sanframondi. Guardia gets its name because it is perched above the whole surrounding area. It contains the remains of a medieval castle (in restoration after a serious earthquake four years ago) and at least three onion-domed, suspiciously Moorish churches. Cantina Morone is new, established in 2011 by brother-and-sister team Eleonora and Giovanni Morone. Giovanni is a doctor based in Rome, which limits his involvement to sales and administration. Giovanni’s medical specialty is the impact of nutrition and diet on health, a focus the pre-disposes him to organic agriculture. Eleonora lives in nearby Talese. She has two children, including a new baby girl. Busy lives! Giovanni and Eleonora are lucky to have Anna della Porta working as consulting enologist in the cellar. Anna has been friends with the Morone siblings since she was five years old. The farm isn’t new. Many of their Piedirosso vines are 25+ years old. The vineyards are roughly 300 meters above sea level, planted in rocky clay-limestone soil. Lots of rounded river bed stones. Eleonora and Giovanni’s father and grandfather worked the vineyards, and sold fruit in bulk to the local cantina sociale, which is the largest co-op in the south of Italy. The cantina socialeof course pays for fruit in bulk, which is a common practice for similar organizations around Europe and the world (of course there are exceptions.) In the recent past, the Morone family would harvest up to 120 hectoliters per hectare: huge yield! Campania is a sunny and fertile place. Vigorous clones were planted. Anna della Porta had a very different vision. Immediately she told Signore Morone to stop irrigating and fertilizing with chemicals, to use biodynamic preparations instead of conventional products, and to do a green harvest (sometimes a second cluster thinning, too.) Yields dropped to 35 hectoliters per hectare. Granddad was furious! He would not speak to Anna. In a previous era, grapevines practically bowing to the ground under the weight of huge yields of fruit were a sign of a good farmer. He saw the fields as unruly. The tractor became rarely used: to keep the soil less compacted. Rows filled with wild grasses and legumes. The elder Morone saw scant fruit on the vine, and despaired. Neighbors talked. Some thought the Morone family had gone crazy. Anna fought hard to prevent family members from uprooting a field planted with a particularly low-yielding, high-quality clone of Falanghina. Even under Anna’s scrupulous quality-oriented plan, Falanghina in Cantina Morone’s fields can produce eight tons per hectare of fruit. This old indigenous parcel yields three tons/ha. Anna won out. Today they bottle “Albanora” separately (all Cantina Morone’s wines are single parcel) and it’s a fantastic wine! The difference between the “normal” newer-clone bottling to this special old Falanghina is incredible. The parcel planted with a “normal” modern clone of Falanghina is called Monaci. It is ripe, a little waxy, tropical and pleasant. It’s called Monaci because the land used to be owned by the priest of Guardia. The church used to be greedy for the best wine, here and everywhere. Albanora is something entirely different. Mineral, markedly more complex, less round, more intense. It is a truly great white wine that reminds us of the wisdom of selecting vine clones for quality reasons, not potential quantity. Of course, if you were being paid in bulk for fruit, not by-the-bottle for wine, Albanora’s vines would make no sense at all. “Working with the soil is not an economic job,” Anna states. Only 3,000 bottles of Albanora were made last year. Alba means sunrise. Anna makes all the wines using a very high-quality closed press that fills with nitrogen during pressing. Eighty percent of Cantina Morone’s wine is white, so working in this oxygen-averse manner makes sense. 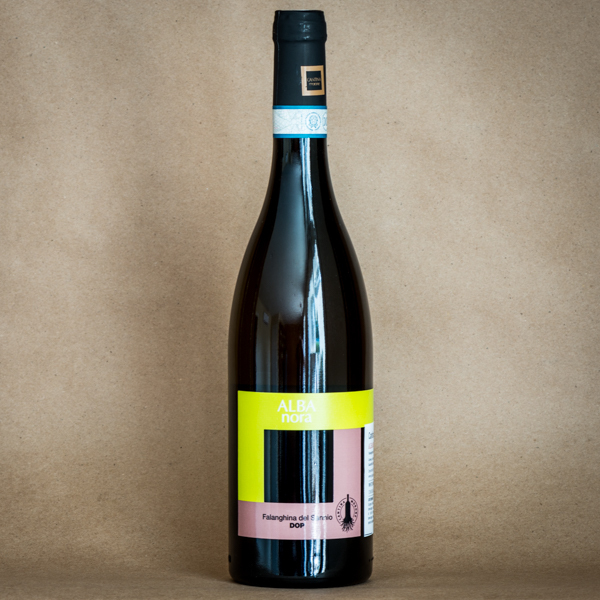 The indigenous white grapes of Sannio (primarily Fiano and Falanghina) oxidize quickly, turning dark in color, losing fresh aromatics, and Anna doesn’t like to use sulfur to slow oxidation. After a gentle pressing for two hours, the must is moved to stainless tanks, blanketed in nitrogen and chilled to five degrees Celsius. Anna prefers to stir the lees for 24 hours to add color but not flavor. Once the temperature of the tank has risen naturally to 15-16 degrees Celsius, fermentation begins. After fermentation, the white wine is filtered gently using a 1-micron filter. Cantina Morone bottle late by regional standards, usually July or August after the harvest. A big brown bag of nitrogen rests in the corner of the courtyard where fruit is unloaded into the cellar via holes (with metal lids) in the floor/ceiling. Cellar ventilation is critical. Life-threatening levels of carbon dioxide can build up if airflow isn’t sufficient underground. The nitrogen system is closed: it flows into the press, is displaced, and flows back into the big brown bag, for use the following day. A truck arrives. Two brothers and two sisters (from a family of 12!) unload dozens of 20-kg baskets directly into a de-stemmer. Along with Giovanni & Elenora’s father, this five-person team does the entire harvest at Cantina Morone. Signore Morone was severely injured last season while working in their Piedirosso vineyard. His tractor hit a large stone, and turned over. It wasn’t outfitted with a protective roll bar, and the machine ended up on top of him. Luckily, significant rain had fallen on the field, and the ground was soft. It gave a little beneath his weight, and the weight of the tractor. This probably saved his life. Still, he has taken a more supervisory role in harvest this season. An intern from oenology school in Pisa shovels dry ice onto the newly-unloaded Falanghina grapes. This is another necessary precaution because Anna prefers not to add sulfur, which is common in wineries at this stage to control oxidation. Bentonite, naturally harvested from caves, is used for clarification of the wines. Anna departs. A winery she assists is done picking, and is going to foot-tread their grapes. I wish I could see it! But my day is getting short. Eleonora sets up a plastic table and chairs on the patio, just a few meters from where all the unloading and de-stemming action took place. The grape pickers gather. Food! Pizza made by Eleonora’s mother, topped with indigenous tomatoes of Vesuvius, a spinach calzone, and mortadella sandwiches made from round rolls that Signore Morone says are the traditional bread of Guardia Sanframondi. And a spinach pie, and a little Fiano. The brothers and sisters seem happy, joking, talking about a beautiful baby just born to another of their sisters. Their kitchen table at home is 6 meters long! At least, that’s what they tell me. The same group has picked grapes here for many years. Happy. A successful harvest.